An excellent sampler of Perdomo's toro sized cigars featuring one from their Lot 23, Champagne, Habano, and Gran Cru lines. Each sampler is available in a set featuring either Connecticut Shade wrappers, Sun Grown wrappers or Maduro wrappers. Enjoy! Sometimes, you just can’t make up your mind about the cigar that you want. 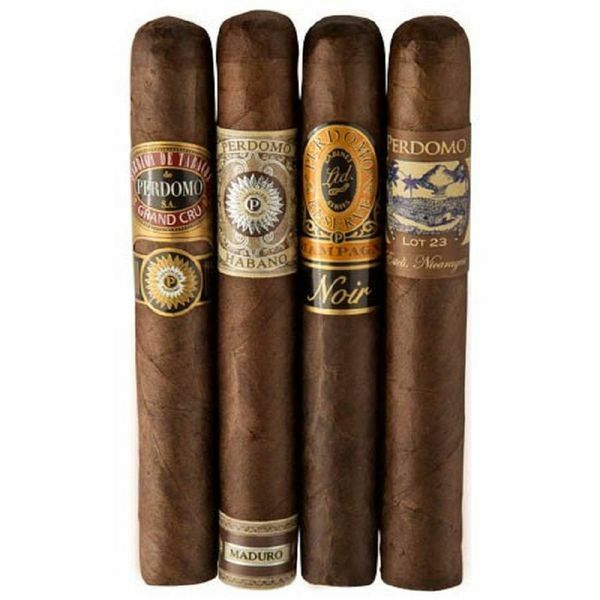 My grandmother was fond of saying that variety is the spice of life, and that being the case, sometimes a sampler of cigars is a great thing, especially if you’re looking at cigars that you may not know much about, which is commonly true of Perdomo cigars. Nick Perdomo, Sr. came from a family that was active in the cigar scene in Cuba. To their misfortune, they were also anti-communists at a time when Cuba was hunting such people down and executing or torturing them. Nick Perdomo, Sr. was himself shot twice. When this misfortune befell him, he knew he had to get out, and with the help of the Catholic church, he made good his escape to the United States while still recovering from the wounds. The cigar brand that would result from Nick Perdomo, Sr. putting his life back together and returning to plying his old trade are quality cigars at affordable prices, and the United States gained another great citizen and cigar maker as a result. The 4-Pack Toro sampler is generally a great choice for those who are looking for cigars online, because it gives you a higher probability of finding something that you will like even when trying a new brand. This four-pack of Toros comes with a Perdomo Gran Cru 2006 Maduro Toro, a Perdomo Habano Maduro Toro, a Perdomo 10th Anniversary Maduro Epicure, and a Perdomo Lot 23 Maduro Toro. These cigars range from medium to medium-full in flavor, and there are a variety of different tastes and flavors in this four-pack, guaranteeing four enjoyable and delicious cigars that you can enjoy at your leisure. A great way to introduce yourself to Perdomo and their products, and a delicious group of cigars, to be sure.